Fire officials in the town of Satanta in southwest Kansas say it is now safe for residents to return home. 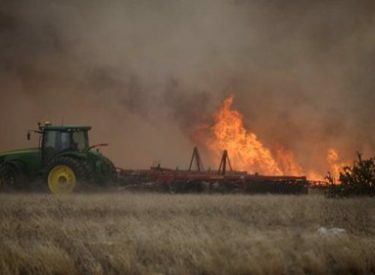 The town was evacuated Sunday afternoon due to a large grass fire burning near the city limits. The fire, which started around noon, was 80 percent contained when winds rekindled the flames around 6:30 p.m. The 1200 residents of Satanta were bussed to an emergency shelter at Sublette High School according to the Haskell County Sheriff’s Office. The fire burned more than 15 square miles. Officials closed U.S. 56 and U.S. 83 from Sublette to K-190, and K-190 south of Satanta to K-160 in Grant County. Highway 56 at COunty Road FF is closed to westbound traffic due to flare-ups. Two trailers homes at Cattle Empire #3 were damaged. One home was damaged near Miller Feed Lot. One fire fighter was reported to be injured. Southwest Kansas remains under a red flag warning issued by the National Weather Service.